NASA's Mars Exploration Rover Opportunity, working on Mars since January 2004, passed marathon distance in total driving on March 24, 2015, during the mission's 3,968th Martian day, or sol. A drive of 153 feet (46.5 meters) on Sol 3968 brought Opportunity's total odometry to 26.221 miles (42.198 kilometers). Olympic marathon distance is 26.219 miles (42.195 kilometers). The gold line on this image shows Opportunity's route from the landing site inside Eagle Crater, in upper left, to its location after the Sol 3968 drive. The mission has been investigating on the western rim of Endeavour Crater since August 2011. This crater spans about 14 miles (22 kilometers) in diameter. The mapped area is all within the Meridiani Planum region of equatorial Mars, which was chosen as Opportunity's landing area because of earlier detection of the mineral hematite from orbit. North is up. The base image for the map is a mosaic of images taken by the Context Camera on NASA's Mars Reconnaissance Orbiter. Earlier versions of this map, with other features labeled, are at http://mars.nasa.gov/multimedia/images/?ImageID=5911 and http://mars.nasa.gov/multimedia/images/?ImageID=6470. Opportunity's navigation camera collected the component images of this scene during the 3,948th and 3,949th Martian days, or sols, of the rover's work on Mars (March 3 and 4, 2015). The view is centered toward the east-southeast, from a location on Endeavour Crater's western rim overlooking Marathon Valley, with the floor of Endeavour beyond, and the eastern rim in the distance. In the foreground at center, Opportunity's robotic arm is positioned for examination of a blocky rock called "Sergeant Charles Floyd." Cumulative driving by NASA's Mars Exploration Rover Opportunity surpassed marathon distance on March 24, 2015, as the rover neared a destination called "Marathon Valley," which is middle ground of this stereo view from early March. The scene appears three-dimensional when viewed through blue-red glasses with the red lens on the left. The left-eye and right-eye cameras of Opportunity's navigation camera collected the component images of this scene during the 3,948th and 3,949th Martian days, or sols, of the rover's work on Mars (March 3 and 4, 2015). The view is centered toward the east-southeast, from a location on Endeavour Crater's western rim overlooking Marathon Valley, with the floor of Endeavour beyond, and the eastern rim in the distance. In the foreground at center, Opportunity's robotic arm is positioned for examination of a blocky rock called "Sergeant Charles Floyd." This map shows the southward path driven by Opportunity from late December 2014 until it passed marathon distance on March 24, 2015, during the 3,968th Martian day, or sol, of the rover's work on Mars. Recent drives bring the vehicle close to a science destination called "Marathon Valley" on the west rim of Endeavour Crater. 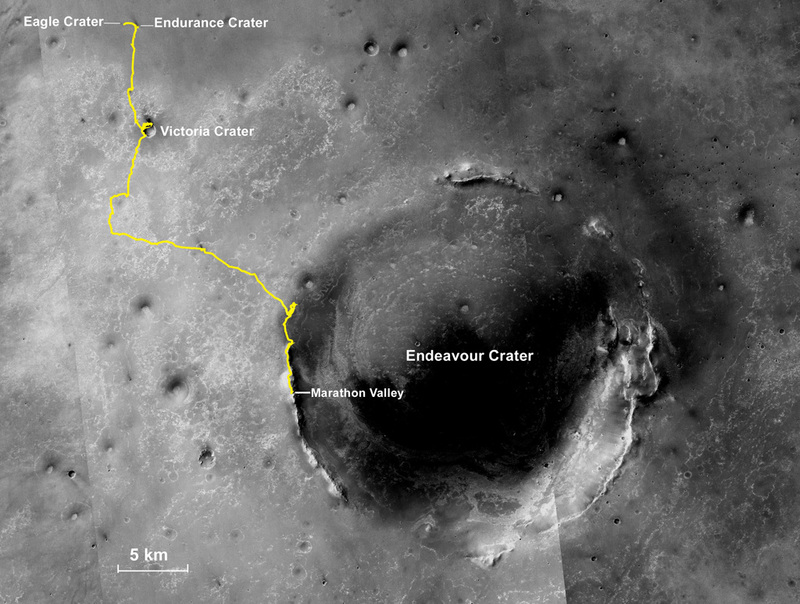 The rover team is using instruments on Opportunity to study "Spirit of St. Louis Crater" before entry into Marathon Valley. Opportunity reached the Sol 3881 location near the top of the map on Dec. 24, 2015. 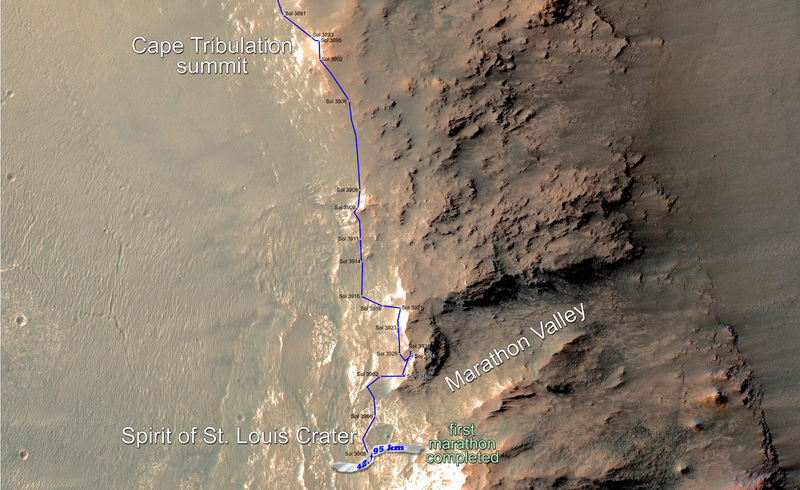 A map showing wider context of Opportunity's route from its January 2004 landing in Eagle Crater to Endeavour Crater is athttp://mars.nasa.gov/multimedia/images/?ImageID=6470. A view from the Sol 3893 location at the summit of "Cape Tribulation," taken the following sol, is at http://mars.nasa.gov/multimedia/images/?ImageID=6935 . The rover's traverse shown here has been mapped onto an image from the High Resolution Imaging Science Experiment (HiRISE) camera on NASA's Mars Reconnaissance Orbiter. Opportunity completed its three-month prime mission in April 2004 and has continued operations in bonus extended missions. It has found several types of evidence of ancient environments with abundant liquid water. NASA's Jet Propulsion Laboratory, a division of the California Institute of Technology in Pasadena, built and operates Opportunity and manages the Mars Exploration Rover Project and the Mars Reconnaissance Orbiter Project for the NASA Science Mission Directorate, Washington. The University of Arizona, Tucson, operates HiRISE, which was built by Ball Aerospace & Technologies Corp. of Boulder, Colorado.